Cite page (MLA): Ward, Megan, and Adrian S. Wisnicki. "Field Diary VII: An Overview." In Livingstone's Final Manuscripts (1865-1873). Megan Ward and Adrian S. Wisnicki, dirs. Livingstone Online. Adrian S. Wisnicki and Megan Ward, dirs. University of Maryland Libraries, 2018. Web. http://livingstoneonline.org/uuid/node/8174f961-541f-4e9a-810d-5f8c705bcc38. This page introduces Field Diary VII, which is part of our critical edition of Livingstone's final manuscripts (1865-73). The essay covers both the first half of the diary, which deals with food scarcity, and the second half, which sets out Livingstone's dealings with two chiefs, Chitapangwa and Moambo. The essay concludes with a description of the diary's physical attributes. Field Diary VII chronicles Livingstone’s journey westward through the Chikokwe Mountains and across the Movoche River (a tributary of the Loangwa River). The diary also represents the last of the field diaries from 1866; no other year of Livingsotne’s final travels (1866-73) will receive this much coverage. All the while, Livingstone is dogged by extreme hunger. What begins as an attempt to hunt a rhinoceros for Christmas dinner in face of the “exorbitant prices” of Kavimba’s village turns into a full-scale famine by the following month (Livingstone 1866f:). Livingstone attributes this food shortage, as in his previous diary, to the threat from the Mazitu people, as they often cannot buy food at villages due to widespread lack. The first half of the diary is necessarily concerned with getting enough food: methods for hunting elephants (which they cannot find), preparations for the maere (millet) porridge on which Livingstone and his men subsist, and attempts to outwit villagers who report no food for sale. Images of two pages of Field Diary VII (Livingstone 1866f:, ). Copyright David Livingstone Centre. Creative Commons Attribution-NonCommercial 3.0 Unported. The page at left (top in mobile) illustrates part of Livingstone's route, while the page at right (bottom) has a section in brown ink that discuss the transportation of Livingstone's letters by Arab travellers. In the ensuing months, Livingstone writes, "it is hard fare and scanty. I feel always hungry & dreaming of better food such as I have enjoyed" (1866f:). His guide deserts due to the lack of food, and Livingstone's hunger reaches it peak after he runs completely out of food because he doled out more to his men than for himself. Fortunately, once they cross the Chambezi River at the end of January, they are once more in a "land of plenty - cows, sheep & goats & corn" though the hunger until then has left him a "a mere bundle of bones" (Livingstone 1866f:). Livingstone does not comment on his men's condition. Since Livingstone and his men now have adequate supplies of food, the second half of the diary is dominated by Livingstone's dealings with two chiefs. Livingstone remains at Chitapangwa's village for weeks, in part delayed by ill health but also by Chitapangwa's demands for cloth, blankets, and a box. 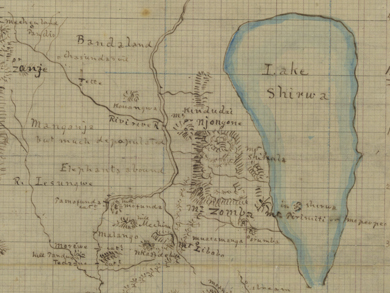 Many pages of the diary record the back-and-forth between Livingstone and Chitapangwa as they negotiate Livingstone's safe passage. Chitapangwe Receiving Dr. Livingstone. Illustration from the Last Journals (Livingstone 1874,1:opposite 185). Courtesy of Internet Archive. Ultimately, Livingstones leaves on 20 February 1867, only to end up several days later in the village of Moamba, who is Chitapangwa's brother. There is further negotiation, but he remains only a week before "part[ing] good friends" and crossing the Merenge river (Livingstone 1866f:). These pages testify both to Livingstone's negotiating skills and to his constant worry that he is being undermined in these negotiations by his men - or "cowardly" boys, as he calls them (Livingstone 1866f:). Livingstone's only encounter with slave traders in this diary occurrs at Chitapangwa's village. The traders are Arabs or, as Livingstone puts it, "blacks all," from Bagamoio; one of them previously traveled with the British explorer John Hanning Speke (Livingstone 1866f:). Although he descries their profession and their allegiance to his rival Speke, Livingstone nonetheless sends them off with 17 letters, a long shopping list of supplies to be sent to Ujiji, and an order for them to be paid 10 rupees when they reach Zanzibar. Images of two pages of Field Diary VII (Livingstone 1866f:, ). Copyright David Livingstone Centre. Creative Commons Attribution-NonCommercial 3.0 Unported. Both pages contain illustrations of African women, which are rare in Livingstone's final diaries. In between these main events, Livingstone records the death of his poodle, Chitane, by drowning while crossing a river, and the desertion of two Waiyau men, who take with them a number of Livingstone's provisions. Notes about local African cultures appear throughout, with a particular focus on conventions of dress and decoration, including many drawings. Livingstone and his men encounter heavy rain during this period, which makes for hard going, especially during the hungry month of January. These circumstances, however, do not diminish the production of notes on the surroundings, including elements of geography, rocks, and plants (especially orchids, rhododendrons, and gum copal trees). Livingstone writes Field Diary VII in a notebook that differs from the first six. This green-covered notebook is bound at the top, so it flips open. Livingstone writes from top to bottom, covering both pages with the spine running horizontally across the middle. The book measures 141 mm high x 89 mm wide x 15 mm thick and inside the front cover are endpapers that announce "Letts, Son & Co.'s Metallic Books," and include tables of information, such as stamp duties, exchange rates, wages table, and weights and measures. Livingstone uses this new notebook in much the same way as the previous diaries, writing from both ends simultaneously. An image of the cover and a commercial insert on the inside of the cover of Field Diary VII (Livingstone 1866f:, ). Copyright David Livingstone Centre. Creative Commons Attribution-NonCommercial 3.0 Unported. The final 29 pages of this 140-page diary are upside-down and include extensive weather records, rain measurements, and geographical calculations. Multiple maps and descriptions describe his surroundings and multiple drawings illustrate local customs. There are also brief entries that correspond with longer descriptions of events in the front section, such as the slavers taking letters to Zanzibar or gum copal trees. Other notes in this section, however, are not elaborated in the front section, such as a drawing and description of how to build a Makololo travelling shed (Livingstone 1866f:). This suggests that Livingstone may have used the final section of this diary to make notes for possible longer entries, not all of which he chose to expand.